The Need for Change starts with a familiar 'problem diagnosis and solution' section that neatly describes the key problems facing almost every business and how to address them. 2. The growing risk of 'reputation exposure' – precisely because of the ease with which these media can be accessed, where a dissatisfied customer might once have told 20 people, he or she can now tell hundreds, thousands or even (read the examples!) millions. 3. Declining staff morale – this is a complex problem made harder in a recession. Your organisation may be one of the rare exceptions, but the issue needs constant attention. 4. The growing demand for instant gratification – linked to our use of the internet and mobile phones, this disruptive change also offers a way in to rethinking your organisations main customer-facing business processes. Stuart Corrigan then outlines ways of thinking about and addressing each of these issues. So far, the book simply makes sense of the 'noise and disruption' facing any manager and proposes some straightforward answers. But, in the final section, Corrigan makes it clear that the approach he's advocating is far from common-sense. 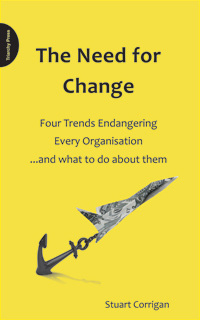 He introduces the tried-and-tested Vanguard method and its key terms and techniques for getting to understand the root causes of the particular problems facing your organisation. He also sets out a method for categorising and diagnosing different service systems which could be the start of a radical reappraisal of your organisation. Stuart Corrigan’s admirably short little book is written for anyone responsible for managing all or part of a service organisation – especially public sector organisations, but including commercial businesses and the service divisions of manufacturing firms. It’s also an excellent, non-technical introduction for anyone interested in Vanguard Method and its application in the public or private sector.